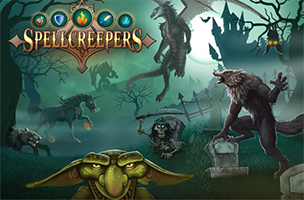 bitComposer Online and Neobird have announced the release of their puzzle RPG Spellcreepers on iOS and Android devices. The game allows players to take control of monsters, sending them into battle against each other in match-three puzzle duels. The game features both single-player and multiplayer game modes, as players take on other real players or the AI. In Spellcreepers, players complete battles with hexagonal symbols, dragging lines to connect three to six symbols to cast spells against the opponent. Players can make a single match of three or more symbols, or two matches of three symbols each to cast two spells in the same move. Swords, fire symbols and more will attack the opponent, while health and shield symbols will increase the player’s defense or health points. In the game’s single-player mode, gamers attack computer-controlled opponents in turn-based battles. In its multiplayer mode, gamers take on other real-players from around the world. As players complete battles, they’ll earn free and premium currency, which can be used to purchase new equipment for their monsters. These items, like swords and helmets, will increase the power of associated matches when created during battle. For instance, a sword will make sword symbols more powerful. Spellcreepers is now available to download for free on iOS and Google Play, and is in development for release on the Amazon App Store, Facebook and browser. Check back soon to follow Spellcreepers on AppData, our tracking platform for mobile and social apps and developers.